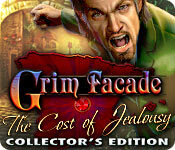 Grim Facade: Cost of Jealousy Collector's Edition is rated 4.0 out of 5 by 75. Rated 5 out of 5 by rosekaufmann from FOR THE GUYS: BEAUTIFUL WOMAN & MALE ASSISTANT The guys will be happy to know what your assistant in this investigation is a man (Aidan). You will be able to interact with some creatures/objects in the scenes which have nothing to do with your investigation (ex: cursor on the cat and watch him hiss). Your hints are limited, but you can get additional hints by finding fans in the locations, including the HOS (which may easily have 2 and which are not on the object list). You will also be amused by the antics of your fennec fox which you imported from South Africa. He, for example likes to run around in huge masks, causing him to trip. LENGTH: A little over 3 ½ hours playing very casually. STORY: Hugo Sanchez has been stabbed in his office and you have been called in to investigate. Your able assistant will compile a file of suspects and clues, as well as voice his admiration for your skills. He will also give you his insights. Hugo’s wife, Gabriela, is almost immediately considered a suspect (no surprise to crime show/books enthusiasts). Had a rather abrupt ending and it was not what you expected when you first were called in to investigate. GAMEPLAY PROGRESSION: Game is mostly adventure. Your first HOS is about 30 minutes into the game and is list-based. They appear periodically, but not too frequently. The color palette is muted, with variations of one or two basic colors with complementary colors thrown in. Nicely done – not too drab to be uninteresting, not too vibrant to be distracting. After about 1 hour, you encounter an interactive silhouette HOS. They are done as nicely as the list-based HOS. Thereafter, you can get either type. [NOTE: a lady bird is a lady bug.] There are also the Find X number of an object. Puzzles are rather easy and widely varied. You usually don’t need to go too far to get the missing pieces. 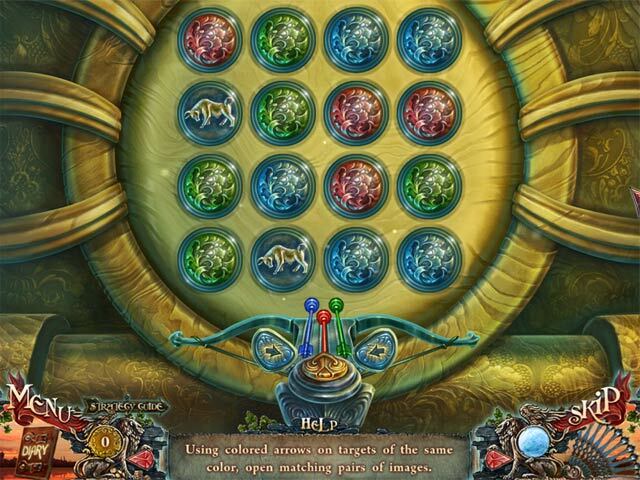 Mini-games are also widely varied and differ in complexity. I did not find them too difficult, except for a couple with inadequate instructions. OTHER STUFF: Voice overs sound really good – not amateurish. And the sound effects are terrific. No map, but none needed. Automatic widescreen. Beautiful graphics – though it Ismeralda either wears the same dress all the time or has several duplicates. Other than poor instructions on a couple minigames, length was its only downfall - I play rather slowly, especially with a lot of lovely scenery to look at, so I think it should have been another hour of play. CE has the usual - up to you if it's worth the additional cost, though I usually like achievements. Rated 5 out of 5 by Mrs_Kim from Best in the series! Grim Facade is my second favorite in all ERS series, after Edgar Allen Poes. It has many good quality story and this one is really superb, excels among all other games in the series. Although ERS again delivers with the usual graphic style, the background music is always different with every game in GF series. Also every game ends the story, not dragging them unnecessarily like PuppetShow series does. The extras in this game is also very nice, in my opinion. I really love the cute fox (hope we can keep him as our game helper!) and the game trivia is very neat. There is no map in this game but there're few backtracking so it is not needed. The game is quite easy so I even didn't use any hint button until chapter 5 or so! The bonus game, however is a bit confusing on what I should do and I have to consult the SG a few times. One downside is that our apprentice, Aldian, seems like boss instead of us being his boss. I feel like we exchange roles with Edgar Allen Poe series where we are the apprentice and Dupin is our leader. The ending of the bonus game is very good and explains what the main game doesn't. This is one of those games that have good bonus chapter. Rated 5 out of 5 by Jem_Jerrica_Guy from Predictable, but the best in this Grim Facade series. The team that developed this has grown. Is it twisted with different motives, but it comes full circle at the end. Even with all this, members say ERS have become predictable, it's not like the first Haunted Legends. Still, for fans of this series, the best is yet to come. Rated 5 out of 5 by boolar from THIS GAME IS WONDERFUL ERS has done it again with another wonderful game. The storyline is refreshing, the music is enjoyable and the art/graphics are among the best. One of the fun things is being able to gather extra hints by finding fans. Rated 5 out of 5 by moontrimmer17 from WOW! Wow! I think this has to be one of the best I've played yet on this site! The sound/voice acting sounds great, the music was catchy (unlike other games where it can sound repetitive), the environments were a fun reprieve from so many dark scenes of other HOGs, and the puzzles ranged from easy to challenging. Definitely worth the price! Rated 5 out of 5 by SelenaLuna from Great story with a great twist! This game has some twists and turns, and it's very interesting. I liked the characters, the passion and the betryal but the best thing was the Visual Quality. Besides, I played other Grim Facade games, and this is another briliant game in the row. Rated 5 out of 5 by Janie42 from Good quality, high fun factor... Based on completed game: An entertaining & colourful CE. Fast-paced gameplay. Enjoyable yet predictable detective plot. Lots of fun adventure tasking. Aiden assistant is annoying, but the fox is a sweet pet, well animated/drawn too. Lovely music, cutscenes & some clever hos along with standard hos. Not too many hos, either! Nice challenge level on hardest & not boring. Puzzles a bit easy, except for one toughie, yay, in bonus part. BONUS gives a nice plot twist <SE ending will still be 100% okay>, good action, all-new settings, fun to play. To me, though, bonus has too many boring standard hos just for filler/padding; BUT other bonus extras are very good: replayable mini-games, hos & movies (which I love); a short, fun trivia game with clever non-usable rewards; & I'm one who adores the concept art & world of colours! On hardest, game took +4.25 & bonus another 1.25 hours. Good value! Rated 5 out of 5 by Sere82 from Loved it! excellent and intriguing storyline,with a really charming spanish setting! Very nice graphics, good soundtrack, many different beautiful locations to explore, great HOS and funny minigames, even if on the easy side..You also have the help of the sweet little fox... The main game took more then 4 hours to complete in expert mode (hint and skip button available, you can change it while playing) and ends conclusively but the bonus chapter, more or less 1 hour of gameplay, is also interesting, almost totally in new areas and with a different surprising conclusion...You have a diary but not a map, there are no collectibles and trophies can be earned only playing the Trivia (not during the adventure) but is anyway a great CE I recommend..if you want something different this is the perfect game to buy! 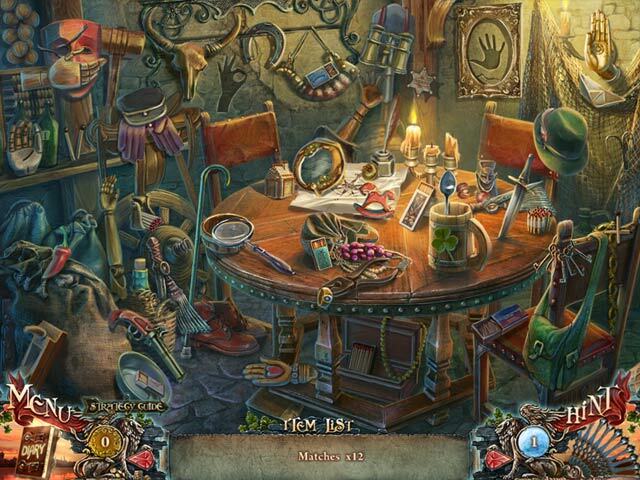 Rated 5 out of 5 by Lucky067 from Cool games Seem good one I like it also I always like playing hidden object that my favour... great for play that make yer memory hard work to find where it is... still good fun to play and worth to buy with games credit that quite cheap.. Rated 5 out of 5 by Starswim from Masterpiece! What a masterpiece of a game from ERS. From the graphics, the flow of the story, the pure artistry and visual feast. From the first click of your mouse, you are transported into a captivating story with beautiful colorful drawn scenes, HO and otherwise, everything about this game is superb. ERS you ROCK!! 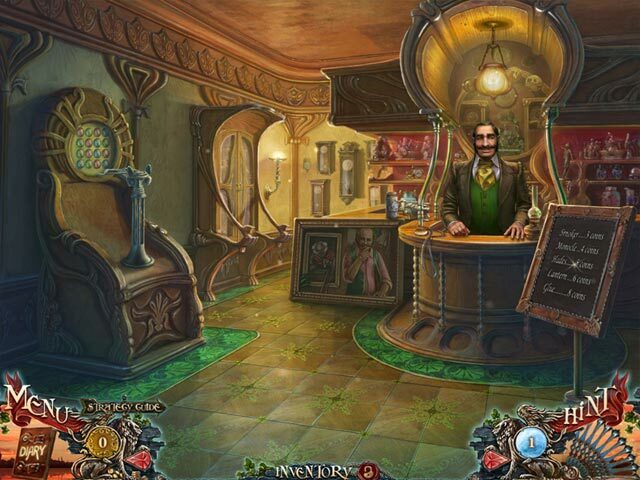 You will never be disappointed with the Grim Facade series and choosing an ERS game makes you a winner! FABULOUS...enjoy fellow gamers! !